This recipe includes a lovely toast loaf that is perfect for hot and cold sandwiches. The chanterelle stew is super tasty on top! If you can´t find chanterelles you can use any mushroom you like. Add the yeast to the cold water and stir to dissolve it. Put the dough onto greased baking trays, cover and let it rise for 1 hour. Preheat an oven to 175° C (347 degrees Fahrenheit). Bake the loaf for 30-40 minutes or until the bread has an inner temperature of 94° C (201.2 degrees Fahrenheit). Clean the Chanterelles and chop them into bite size pieces. Heat a pan on high heat and add the butter. Add the onions and fry them for 2 minutes before adding the Chanterelles. Fry the Chanterelles for 8 minutes. Add the butter and stir. Add the cream. Cut the bread into 2 cm slices. Smear with some butter and put in the oven for 7 minutes or until the toasts are golden brown. 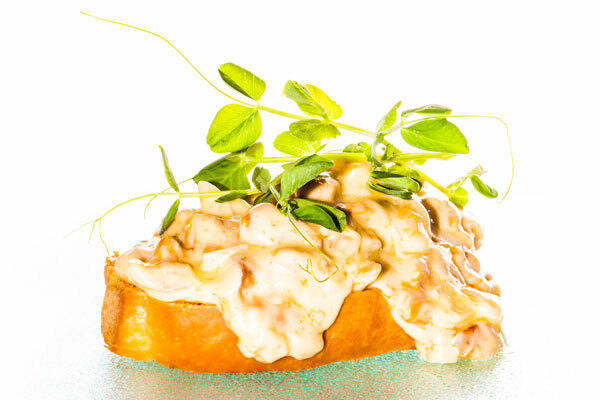 Pour some Chanterelle stew onto the toast. Add a couple of pea shoots on top.